In his book Shirakawa, author Stan Flewelling recounts the story of how Sentaro Tsubota first decided to immigrate to the United States. As their only son, his parents had denied him permission to come to America, despite favorable reports from several friends who had already settled in the Pacific Northwest. Sentaro and his wife Fusano would have to do their best to remain contented with their lives in Japan. History did not record the astonishment that Sentaro’s parents must have felt at this blatant disobedience, or their further astonishment when Sentaro failed to return to Japan as promised after his three-year absence. Instead, Sentaro sent for Fusano in 1906, and the couple moved from Seattle to Kent, where they opened a general store a few short years later. By 1911, Sentaro added a second business—he built a saw mill just off of the West Valley Highway. These entrepreneurial pursuits set the Tsubotas apart from many of their countrymen, most of whom were forced to make their way in their new country as truck farmers or low-paid laborers. Perhaps Sentaro was not so alienated from his rather well-to-do parents that they declined to help him finance his business endeavors in the United States. But the Tsubotas’ lives were not without trials. In 1921, Washington’s Alien Land Law took effect, denying Issei Japanese the ability to own or even lease land in their own names. How this impacted the Tsubotas’ businesses we cannot know for sure, but it is interesting to note that in the 1920 Federal Census, Sentaro Tsubota’s occupation was listed as mill owner; by the time of the 1930 Census, he was listed as simply a farmer. Other more personal tragedies afflicted the family as well. 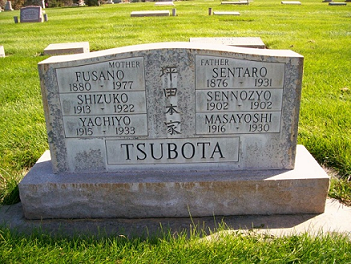 In 1922, the Tsubotas lost their young daughter Shizuko at age 9. Almost a decade later, a string of deaths rocked the family. First, in 1930, son Masayoshi died at age 14. A year later Sentaro himself passed away, leaving Fusano to support their large family at the height of the Great Depression. Finally, in 1933, 18-year-old daughter Yachiyo Rose Tsubota passed away just as she was becoming an adult in her own right; the Kent newspaper reported that Yachiyo was buried in the Japanese cemetery at Christopher. Fusano’s grief during these years must have been overwhelming. In the coming years, Fusano’s household grew smaller and smaller. Several of her surviving children married and began families of their own during this time. Her youngest child Minoru enlisted in the U.S. Army in early 1941, just as the Second World War was getting underway. Shortly after Japan bombed Pearl Harbor in December of that year, Minoru became a member of the famous 442nd Regimental Combat Team. He participated in campaigns in Italy and France, and was among the first Americans to arrive at Germany’s Dachau Concentration Camp and help liberate its Jewish inmates. Ironically, as Minoru was earning a Bronze Star and Purple Heart for his exceptional military service, his mother languished in one of America’s own concentration camps (as President Roosevelt initially referred to the Japanese internment centers). She was sent first to California's Tule Lake Internment Center before eventually being transferred to Idaho’s remote Minidoka Internment Camp. She remained there until the end of the War. Photo by Cheryl Hanson; used with permission. After the closure of the internment centers, it appears that Fusano never returned to Washington. Although Minoru and his family eventually settled back in Seattle, Fusano and several of her other children instead settled in Ontario, Oregon—a city that welcomed the Japanese who had been unjustly imprisoned just across the border in Idaho. When Fusano died there in 1977, her family buried her in Ontario’s Evergreen Cemetery, erecting a stone to her memory that also lists the baby she lost in Japan, as well as the family members who died in Washington State years before World War II. Because daughter Yachiyo’s obituary states that she was buried in the Japanese cemetery in Christopher (Auburn Pioneer, in other words), it’s probable that she and the other relatives who died in Washington State all share the same, unmarked plot in the cemetery there. The marker in the Ontario cemetery likely marks the place of Fusano’s inurnment and serves as a cenotaph for the other deceased family members. Min Tsubota served in the 522nd Field Artillery Battalion of the 442nd Regimental Combat Team and served in Italy, France and Germany. 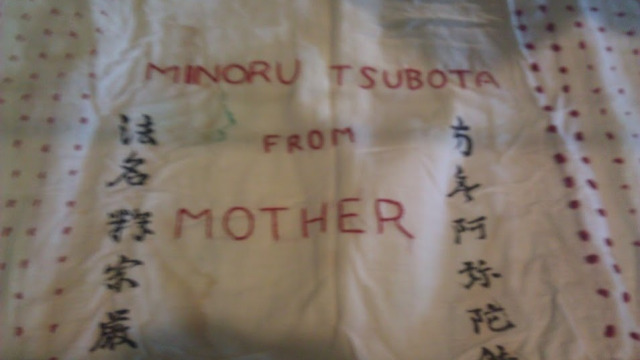 His mother, who was uprooted from their family home in Kent and incarcerated in Tule Lake concentration camp in California, sent Tsubota a letter and this senninbari before he was deployed overseas to the Italian front with his unit. Tsubota says he wore what he calls this "sash of good luck" through all the battles he was in. Senninbari translates to "thousand persons stitches" and is a strip of cloth with 1000 red knots that are each stitched by a different woman. Red was a color that was said to ward off evil and bad luck. It was given to soldiers as good luck to keep them safe in battle and ensure their safe return home. Tsubota says that he always pictured his mother standing at various locations at Tule Lake asking each woman she met to add one stitch to his senninbari. In 1995 Tsubota wrote, "I have often reflected on how and why I managed to survive the war. I would like to believe that it was due somehow to my senninbari, WHICH TRULY REFLECTED MY MOTHER'S LOVE." The above article regarding the Tsubota's senninbari was published in April of 2012 by the Japanese Cultural and Community Center of Washington as part of the NW Nikkei Museum's exhibit Art Behind Barbed Wire. en-denshovh-tminoru-01-0038-1. (2012, July 2). Densho Encyclopedia. Retrieved 14:01, May 11, 2013.